Posted by Matthew Townend in VoIP Numbers. 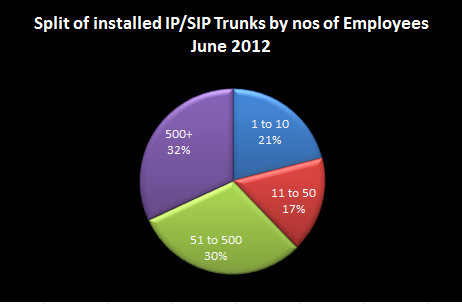 Following the completion of illumes biannual industry research, we can report that the IP/SIP trunking market has reached 570,232 trunks. This figure represents continued strong growth from the previous period, and shows no signs of slowing up with Service Providers reporting strong funnels in the coming months. As you can see by the chart above the market is still dominated by large organisations, who generally have delivered IP/SIP trunks over quality enabled networks. However we are starting to see the impact of both EFM and FTTC technologies, which will open up the SME opportunity further. Also Enterprise provider were starting to see customer utilise Microsoft Lync as a replacement to an onsite PBX, and 60% of providers we undertaking testing of Microsoft Lync with their SIP/IP Trunking solutions. The VoIP market continues to perform well, although the growth slowed slightly with the market hitting 995,059 seats at the end of June 2012. While undertaking our research it was also clear that we are starting to see the impact of the new “Multi instance” services being offered by Cisco, Mitel & others with Ciscos HCS service and Mitel MICD services. We have seen recent launches from Talk Talk and Vodafone in the UK market and we know of many global providers looking to role out Cisco’s HCS service in the near future. These launches are normally focussed at the enterprise, where some customers prefer multi instance approach, to the traditional multi tenant. It also signifies a more aggressive move from traditional PBX players into the hosted market, as CPE sales continue to decline. For the first time illume has also published the split of users by company size showing that there was 22% of the market in 1-10 employee segment, 21% of the market in 11- 50 employees segment, 15% of the market in 51-500 & 42% in the 500+. We also looked at the split of Data usage and its clear that EFM and FTTC technologies are starting to have an impact, but managed ADSL and VPN technologies being most prominent. The other theme that came through our interviews, was that providers were focussing heavily on the use ability of their services and interfaces rather than a race for new features. Also providers were skill sceptical about the likely success of Microsoft Lync as a Multi tenanted hosted offering. illume will be updating its market reports and forecast in August to reflect these latest market changes.